Alcohol consumption in Russia remains among the highest in the world. According to a 2011 report by the World Health Organization, annual per capita consumption of alcohol in Russia was about 15.76 litres, the fourth-highest volume in Europe. Another dangerous trait of Russian alcohol consumption pattern was the high volume of spirits compared with other alcoholic drinks (such as beer or red wine). Russia currently implements a variety of anti-alcoholism measures (banning spirits and beer trade at night, raising taxes, and others). According to medical officials, these policies have resulted in a considerable fall of alcohol consumption volumes, to 13.5 litres by 2013, with wine and beer overtaking spirits as the main source of beverage alcohol. These levels are comparable with European Union averages. Alcohol producers claim that falling legal consumption is accompanied by growth in sales of illegally produced drink. High volumes of alcohol consumption have serious negative effects on Russia's social fabric and bring political, economic and public health ramifications. 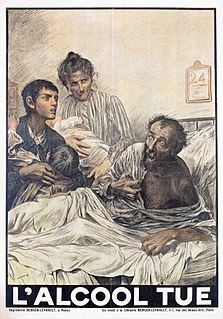 Alcoholism has been a problem throughout the country's history because drinking is a pervasive, socially acceptable behaviour in Russian society and alcohol has also been a major source of government revenue for centuries. It has repeatedly been targeted as a major national problem, with mixed results. Alcoholism in Russia has according to some authors acquired a character of a national disaster and has the scale of a humanitarian catastrophe. Legend holds that the tenth-century Russian prince Vladimir the Great rejected Islam as a state religion for the country because of its prohibition of alcohol. Historically, alcohol has been tolerated or even encouraged as a source of revenue. In 1909 average alcohol consumption was said to be 11 bottles per capita per year. An estimated 4% of the population of St.Petersburg were estimated to be alcoholics in 1913. Soviet leaders Nikita Khrushchev, Leonid Brezhnev, Yuri Andropov, and Konstantin Chernenko all tried to stem alcoholism. Mikhail Gorbachev increased controls on alcohol in 1985; he attempted to impose a partial prohibition, which involved a massive anti-alcohol campaign, severe penalties against public drunkenness and alcohol consumption, and restrictions on sales of liquor. The campaign was temporarily successful in reducing per capita alcohol consumption and improving quality-of-life measures such as life expectancies and crime rates, but it was deeply unpopular among the population and it ultimately failed. In 2006, a new alcohol excise stamp known as the EGAIS system was introduced, allowing to identify every bottle sold in Russia through a centralized data system. In 2012, a national ban on sales of all types of alcoholic beverages from 11 p.m. to 8 a.m. was introduced to complement regional bans . In December 2016, 49 people in Irkutsk died in a mass methanol poisoning. Medvedev reacted by calling for a ban on non-traditional alcoholic liquids like the bath lotion involved in this case, stating that "it's an outrage, and we need to put an end to this". In recent years, alcohol related deaths in Russia have dropped dramatically year over year falling to 6,789 in 2017 from 28,386 in 2006 and continuing to decline into 2018. In 2007, Gennadi Onishenko, the country's chief public health official, voiced his concern over the nearly threefold rise in alcohol consumption over the past 16 years; one in eight deaths was attributed to alcohol-related diseases, playing a major role in Russia's population decline. Men are particularly hit hard: according to a U.N. National Human Development Report, Russian males born in 2006 had a life expectancy of just over 60 years, or 17 years fewer than western Europeans, while Russian females could expect to live 13 years longer than their male counterparts. A 1997 report published in the Journal of Family Violence found that among male perpetrators of spousal homicide, 60–75% of offenders had been drinking prior to the incident. In 2008, suicide claimed 38,406 lives in Russia. With a rate of 27.1 suicides per 100,000 people, Russia has one of the highest suicide rates in the world, although it has been steadily decreasing since it peaked at around 40 per 100,000 in the mid-late 1990s, including a 30% drop from 2001 to 2006. Heavy alcohol use is a significant factor in the suicide rate, with an estimated half of all suicides a result of alcohol abuse. This is evident by the fact that Russia's suicide rate since the mid-'90s has declined alongside per capita alcohol consumption, despite the economic crises since then; alcohol consumption is more of a factor than economic conditions. Prophylactoriums, medical treatment centres, were established in 1925 to treat alcoholics and prostitutes. By 1929 there were five in Moscow. Chronic alcoholics evading treatment were detained for up to two years. One alternative therapy for alcoholism that has been used in Russia is the practice of "coding", in which therapists pretend to insert a "code" into patients' brains with the ostensible effect that drinking even small amounts of alcohol will be extremely harmful or even lethal. Despite not being recommended in Russian clinical guidelines, it has enjoyed considerable popularity. In recent years its use has lessened, due to the spread of information about its ineffectiveness. ^ "Global status reporton alcohol and health - WHO" (PDF). 2011. Retrieved February 26, 2016. ^ "Россияне стали меньше пить". October 17, 2013. Retrieved February 26, 2016. ^ "Анализ алкогольного рынка в 2013 году - рост и падение". RosInvest. March 19, 2014. Retrieved February 26, 2016. ^ "Russia declares war on alcoholism". RIA Novosti. January 14, 2010. ^ "Each of 7 million Russian alcoholics drinks 27 liters of alcohol a year". Pravda. November 9, 2006. ^ a b c d e McKee, Martin (1999). "Alcohol in Russia". Alcohol and Alcoholism. Oxford Journals. 34 (6): 824–829. doi:10.1093/alcalc/34.6.824. PMID 10659717. ^ a b c d Claire Suddath (January 5, 2010). "A Brief History of Russians and Vodka". Time magazine. Archived from the original on 25 May 2010. Retrieved May 10, 2010. ^ a b c Dorman, Nancy D.; Towle, Leland H. (1991). "Initiatives to curb alcohol abuse and alcoholism in the former Soviet Union". Alcohol Health & Research World. ^ a b Tony Halpin (April 13, 2007). "Health alert as Russia's alcohol consumption triples". The Times. ^ "Russia may soon be booze free". Fin24. 2006-07-27. Retrieved 4 September 2017. ^ Kate Transchel (January 18, 2010). "Opinion: Why a $3 bottle of vodka won't cut it". Global Post. Retrieved May 10, 2010. ^ Khaltourina, Daria, and Andrey Korotayev. "Effects of Specific Alcohol Control Policy Measures on Alcohol-Related Mortality in Russia from 1998 to 2013." Alcohol and Alcoholism (2015): 2015) 50 (5): 592. ^ Petroff, Alanna (December 31, 2014). "Russia slashing vodka prices as economy reels". CNN. Retrieved 1 January 2015. ^ Isachenkov, Vladimir (2016-12-19). "Alcohol poisoning death toll in Russian city rises to 49". Associated Press. Retrieved 2016-12-19. ^ a b Zaridze, David; Brennan, Paul; Boreham, Jillian; Boroda, Alex; Karpov, Rostislav; Lazarev, Alexander; Konobeevskaya, Irina; Igitov, Vladimir; et al. (2009). "Alcohol and cause-specific mortality in Russia: a retrospective case—control study of 48 557 adult deaths". The Lancet. 373 (9682): 2201–2214. doi:10.1016/S0140-6736(09)61034-5. PMC 2715218. PMID 19560602. ^ "Alcohol blamed for half of '90s Russian deaths". Associated Press. June 25, 2009. Retrieved May 10, 2010. ^ "Russia's alcohol consumption more than 100% above critical level". RIA Novosti. September 24, 2009. ^ John Moody; James O. Jackson; Nancy Traver (October 21, 1985). "Soviet Union Fighting the Battle of the Bottle". Time magazine. Retrieved May 12, 2010. ^ a b "Interpersonal Violence and Alcohol in the Russian Federation" (PDF). Violence and Injury Prevention Programme - WHO Regional Office for Europe. 2006. Retrieved February 26, 2016. ^ Jargin, Sergei (27 July 2006). "Learning from the Russians". British Medical Journal. Retrieved 29 May 2017. ^ Treatment systems overview. Strasbourg: Council of Europe Publishing. 2010. pp. 127–128. ISBN 978-92-871-6930-3. Retrieved June 14, 2011. ^ Mosher, Clayton (2007). Drugs and Drug Policy. Thousand Oaks: Sage. p. 269. ISBN 978-0-7619-3007-5. Retrieved June 9, 2011. ^ Finn, Peter (October 2, 2005). "Russia's 1-Step Program: Scaring Alcoholics Dry". Washington Post. Retrieved June 9, 2011.
WHO (2004). "Country Profiles. Russian Federation" (PDF). WHO Global Status Report on Alcohol . Jargin, SV (2010). "On the causes of alcoholism in the former Soviet Union". Alcohol and Alcoholism. 45 (1): 104–5. doi:10.1093/alcalc/agp082. The best available current evidence suggests that consumption of alcohol does not improve health. Previous assertions that low or moderate consumption of alcohol improved health have been deprecated by more careful and complete meta-analysis. Heavy consumption of ethanol can cause severe detrimental effects. Health effects associated with alcohol intake in large amounts include an increased risk of alcoholism, malnutrition, chronic pancreatitis, alcoholic liver disease and cancer. In addition, damage to the central nervous system and peripheral nervous system can occur from chronic alcohol abuse. Even light and moderate alcohol consumption increases risk for certain types of cancer. Liquor is an alcoholic drink produced by distillation of grains, fruit, or vegetables that have already gone through alcoholic fermentation. 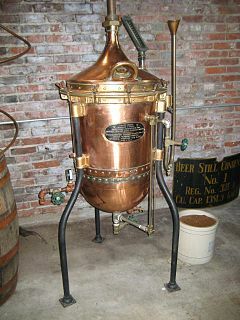 The distillation process purifies the liquid and removes diluting components like water, for the purpose of increasing its proportion of alcohol content. As liquors contain significantly more alcohol, they are considered "harder" – in North America, the term hard liquor is used to distinguish distilled alcoholic drinks from non-distilled ones. The Russian Cross is the name of a demographic trend that occurred in Russia. Starting in 1988, birth rates among native Russians were declining, while from 1991 the death rates started climbing. The alcohol belts of Europe are regions in Europe which are considered to be divided by association with either beer, wine, or spirits. The alcohol belts refer to the traditional beverages of countries rather than what is most commonly drunk by the populace today, as in terms of drinking habits beer has become the most popular alcoholic drink in the whole world, including various parts of the wine and vodka belts. Binge drinking, or heavy episodic drinking, is a modern epithet for drinking alcoholic beverages with an intention of becoming intoxicated by heavy consumption of alcohol over a short period of time, but definitions vary considerably. Daria Andreyevna Khaltourina is a Russian sociologist, anthropologist, demographer, and a public figure. She is the head of the Group of the Monitoring of Global and Regional Risks of the Russian Academy of Sciences, co-chairperson of the Russian Coalition for Alcohol Control, as well as the Russian Coalition for Tobacco Control. She is a laureate of the Russian Science Support Foundation Award in "The Best Economists of the Russian Academy of Sciences" nomination (2006). Native Americans in the United States have historically had extreme difficulty with the use of alcohol. Problems continue among contemporary Native Americans; 11.7% of the deaths among Native Americans and Alaska Natives are alcohol-related. Use of alcohol varies by age, gender and tribe with women, and older women in particular, being least likely to be regular drinkers. Native Americans, particularly women, are more likely to abstain entirely from alcohol than the general US population. Frequency of use among Native Americans is generally less than the general population, but the quantity consumed when it is consumed is generally greater. Alcohol-related brain damage alters both the structure and function of the brain as a result of the direct neurotoxic effects of alcohol intoxication or acute alcohol withdrawal. Increased alcohol intake is associated with damage to brain regions including the frontal lobe, limbic system, and cerebellum, with widespread cerebral atrophy, or brain shrinkage caused by neuron degeneration. This damage can be seen on neuroimaging scans. In December 2016, 78 people died in a mass methanol poisoning in Irkutsk, one of the largest cities in Siberia, Russia. Precipitated by drinking counterfeit surrogate alcohol, the death toll led the Associated Press news agency to call it "unprecedented in its scale".